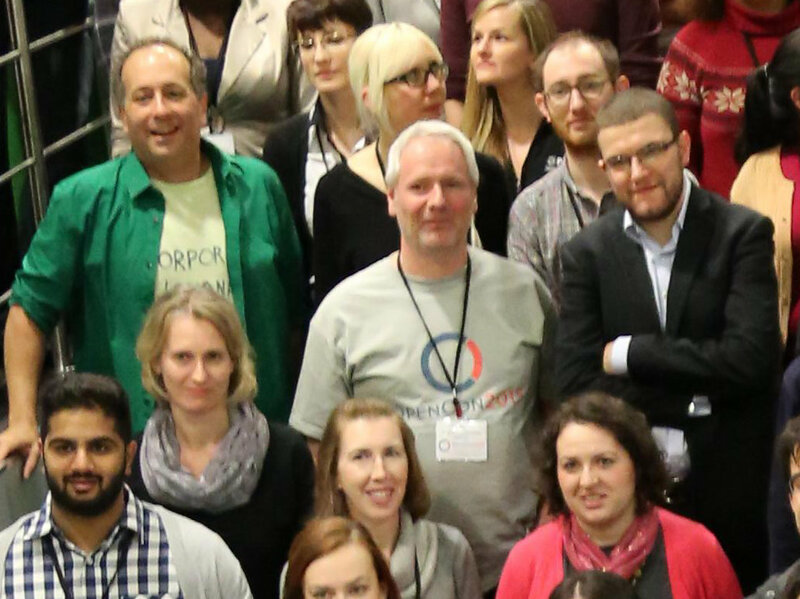 I got back on Tuesday from OpenCon 2015 — the most astonishing conference on open scholarship. Logistically, it works very different from most conferences: students have their expenses paid, but established scholars have to pay a registration fee and cover their own expenses. That inversion of how things are usually done captures much of what’s unique about OpenCon: its focus on the next generation is laser-sharp. It was striking the opening session, on Saturday morning, consisted of consecutive keynotes from Mike and then Erin. Both are now free to watch, and I can’t overstate how highly I recommend them. Seriously, make time. Next time you’re going to watch a movie, skip it and watch Mike and Erin instead. 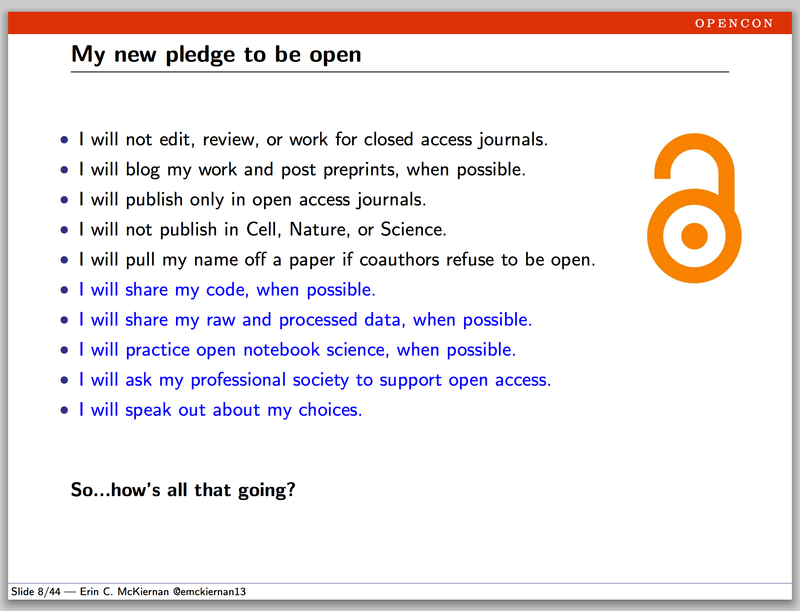 Much of Mike’s talk was history: how he and others first became convinced of the importance of openness, how E-biomed nearly happened and then didn’t, how PLOS started with a declaration and became a publisher, and so on. What’s striking about this is just how much brutal opposition and painful discouragement Mike and his colleagues had to go through to get us to where we are now. The E-biomed proposal that would have freed all biomedical papers was opposed powerfully by publishers (big surprise, huh?) and eventually watered down into PubMed Central. The PLOS declaration collected 34,000 signatures, but most signatories didn’t follow through. 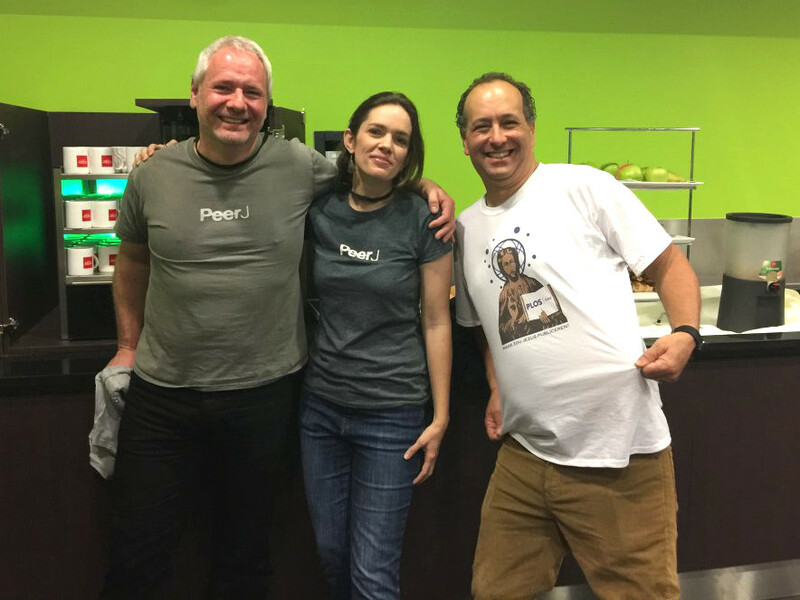 PLOS as a publisher was met with scepticism; and PLOS ONE with derision. It takes a certain strength of mind and spirit to keep on truckin’ through that kind of setback, and we can all be grateful that Mike’s was one of the hands on the wheel. At a much earlier stage in her career, Erin’s pledge to extreme openness reflects Mike’s. It’s good to see that so far, it’s helping rather than harming her career. 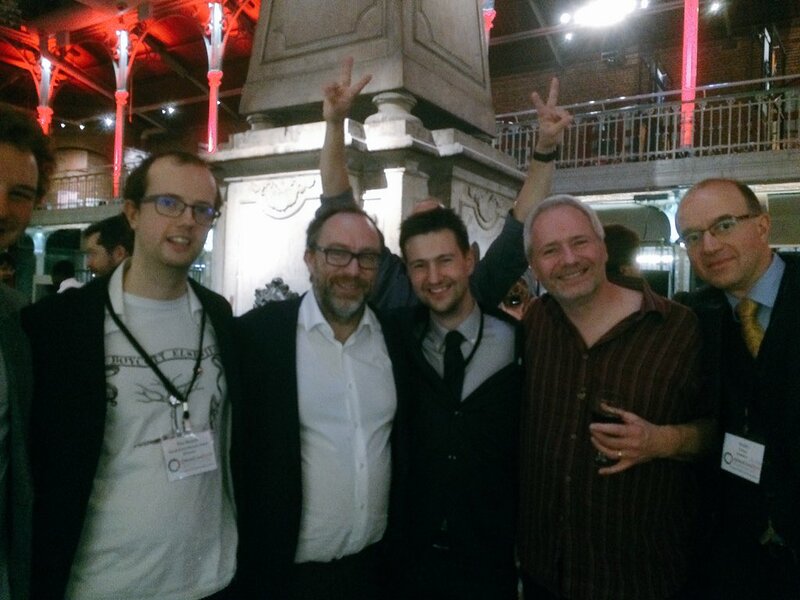 Oh, and how often do you get to rub shoulders with Jimmy Wales? The sheer amount of innovation and hard work that’s going on just blew me away. 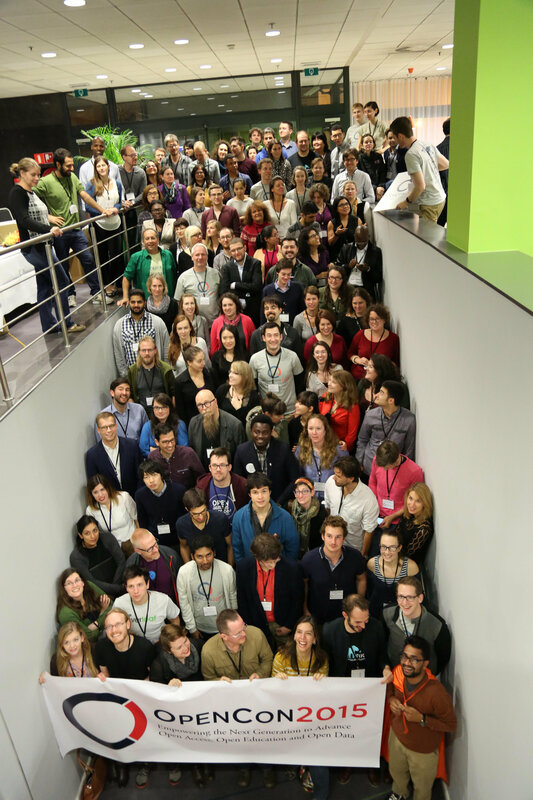 So: OpenCon 2015 community, I salute you! May we meet again! 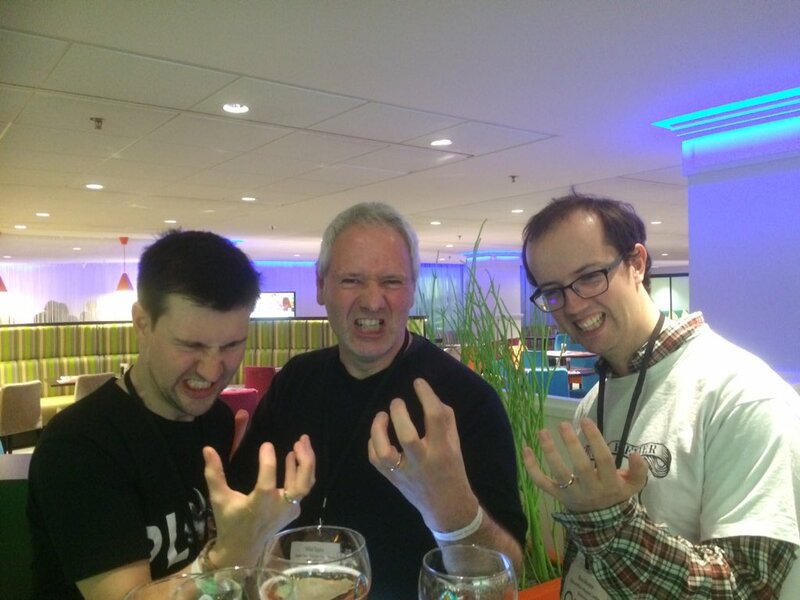 The palaeontology contingent at OpenCon 2015, all reminding you to Measure Your Damned Dinosaur! Left to right: Jon Tennant, Mike Taylor, Ross Mounce. The article publishing charge at Lingua for open access articles is 1800 USD. The editor had requested a price of 400 euros, an APC that is not sustainable. Had we made the journal open access only and at the suggested price point, it would have rendered the journal no longer viable – something that would serve nobody, least of which the linguistics community. The new Lingua will be hosted at Ubiquity Press, a well-established open-access publisher that started out as UCL’s in-house OA publishing arm and has spun off into private company. The APC at Ubiquity journals is typically £300 (€375, $500), which is less than the level that Elsevier describe as “not sustainable” (and a little over a fifth of what Elsevier currently charge). Evidently Ubiquity Press finds it sustainable. You know what’s not sustainable? Dragging around the carcass of a legacy barrier-based publisher, with all its expensive paywalls, authentication systems, Shibboleth/Athens/Kerberos integration, lawyers, PR departments, spin-doctors, lobbyists, bribes to politicians, and of course 37.3% profit margins. The biggest problem with legacy publishers? They’re just a waste of money. OK, this is not so much an interesting specimen as a handy hint. We hosted a picnic during the summer and it was absolutely infested with wasps. (One person was stung — everyone else had to look super-carefully at their sandwiches before each bite.) 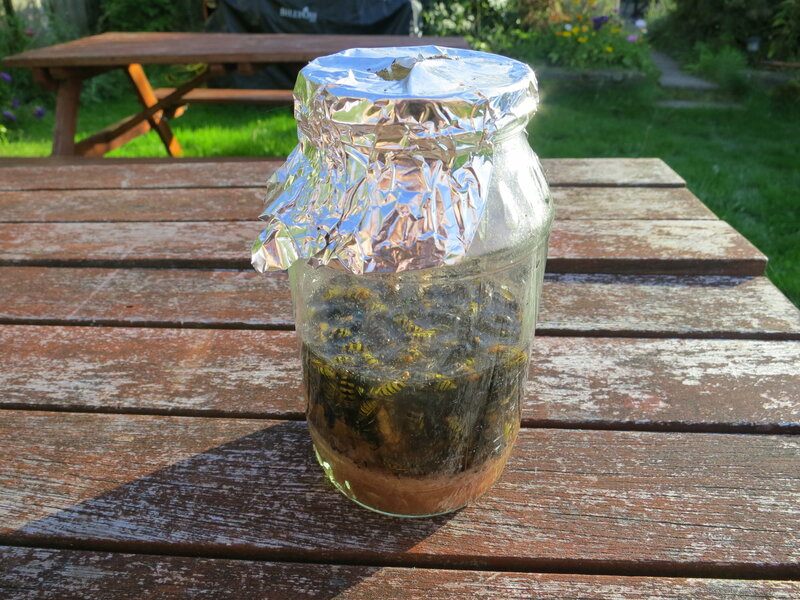 That made me realise we needed to get rid of all the wasps that haunt the garden, and this trap is the solution. It could hardly be simpler: it’s an old jar with a tablespoon of jam in the bottom, topped up to half way with water. Then a tinfoil lid with a small hole poked through it with a teaspoon handle. For some reason, wasps just can’t resist it: they crawl in, then drown themselves in the water trying to get to the jam. Then more wasps come. 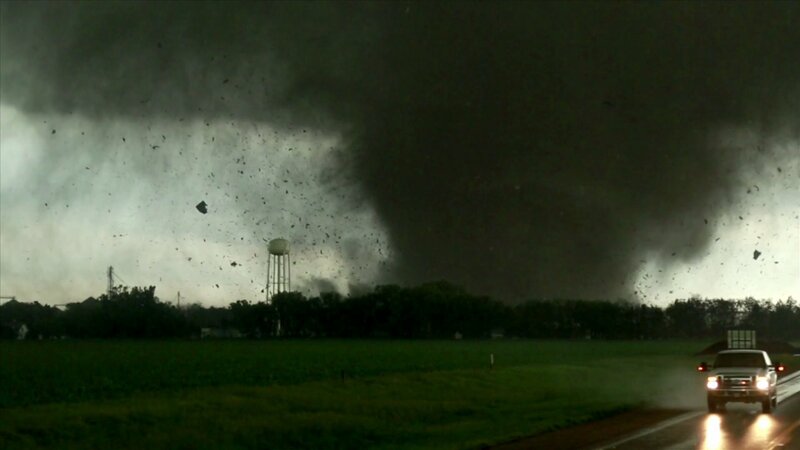 And they just keep coming, as you can see in the photo. We’re going to have to dig the wasps out and throw them away so that the trap has enough space for more. The great thing about this is that it only seems to catch wasps: not bees, which simply don’t seem to see the appeal in jam-water.